It's official. 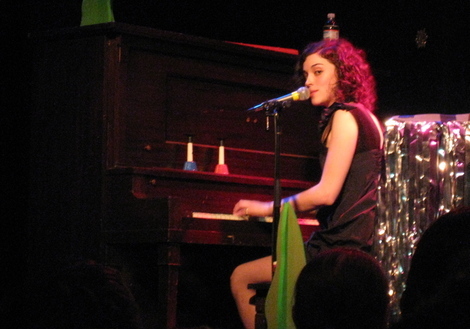 I have a crush on Annie Clark, a.k.a. 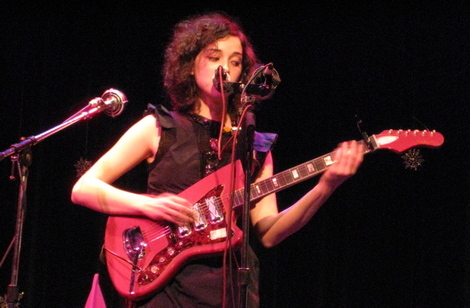 St. Vincent. I can't help it. Last night at the Cedar Cultural Center she disarmed me with her charm, humility and all-around resplendence. Then she blew me away with her ambrosial vocal dexterity and gift of being able to strum a delicate string of chords together on the guitar one minute and completely shred it with mastery the next. I had some notion of what to expect going into the night and had been looking forward to it all week. At the end of the evening, all of my expectations were greatly surpassed and I now have a new-found appreciation for Ms. Clark not only as a chanteuse, but also as a delightful woman willing to share more than just her music with her fans. Some artists use pedals, effects and a variety of microphones to cover for a lack of talent. Not Annie. She uses these tools to take her music and natural abilities to another level. She kept the pace of the show undulating expertly throughout the night, starting off with a couple of her more popular/known songs*, moving into a mix of stuff off of Marry Me, bringing out one or two new songs and rocking out a phenomenal solo cover of The Beatles song "Dig A Pony." Her interactions with the crowd were endearing and engaging. Between songs, she responded to louder comments made by enamored members of the audience and shared stories from recent adventures on the road. She was genuine and playful. At times, she was even a bit demure. She appeared to be truly flattered that people applauded and cheered after each song. When she couldn't quite get her guitar tuned to the perfect note, rather than continue fussing with it, she'd just stop, say something to the effect of, "Oh, the hell with it. It's a rock show, right?" and then begin playing. Every glowing review that has been written of her live performances is well deserved. I can honestly say this was one of the best shows I've been to in quite some time. It was one of those shows where nobody in the audience wanted to see it come to an end, least of all, myself. I will definitely go back to see her the next time she comes to town or if she happens to be playing somewhere I also am at the moment. Thank you, Annie. Thank you for not only sharing your music with the world, but for also being so open, real, elegant and interesting when performing it. Spring Is Getting Closer, Right?